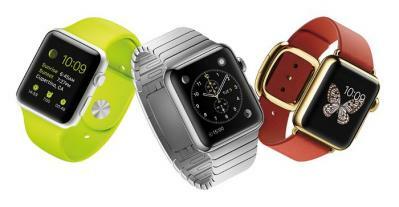 Ten days ago Apple unveiled the Apple Watch, their first smartwatch product. The company did not reveal the display technology - they just said it was a flexible Retina display. The Watch itself will only be released in "early 2015", and I thought we'd have a long time to wait before we know whether this is an OLED or LCD display. But according to several sources, it is now confirmed that the Watch uses an OLED. I cannot disclose all the sources, but my trusted and knowledgeable friend Jennifer Colegrove from Touch Display Research says she's 100% sure it is an AMOLED (it is interesting that in June 2013 Jennifer forecasted that Apple will adopt an AMOLED in a product within 18 months, and she hit it right on the mark). There are still some unanswered questions. For example, what kind of OLED display is Apple using? It is highly likely that Apple uses a flexible OLED (mostly because they call it a flexible Retina). Jennifer says she's "90% sure it's a flexible OLED". Even though the display is not curved, a plastic OLED is still thinner and lighter than a glass-based OLED so it's much more suited for a wearable device. It's also possible that a plastic-based OLED will be adopted in some of the Watch models, while others will use a glass based panel. There's also the question of the display supplier. But it is pretty much clear at this stage that LG Display is the exclusive OLED supplier. This has been reported months ago. Later on it was reported that Apple may be interested in signing a deal with SDC too for the same flexible OLEDs, but apparently that did not happen. This AMOLED panel is very small, and even if Apple manages to sell hundreds of millions of Watch devices it is not very significant in terms of OLED production capacity. But all in all this is great news and when it becomes public it may give a terrific validity and a great boost to OLED technology. We've been waiting for Apple to adopt OLEDs for years now (I remember Barry Young referring to Apple as part of the "axis of evil" back in 2012) and now finally in 2015 we'll see the first Apple OLED product. Maybe it is too soon, but the famous iFixIt web site can confirm what the Apple Watch is made of. They have a constant record of Apple product disassembly (teardown) to evaluate the construction and materials, and rate the ease of repair and reassembly for future product users. Give them some time, then visit the web site next month. The famous iFixIt web site, which is known for constant Apple product teardowns (they already did teardowns for the iPhone 6), will probably do a teardown of the Apple Watch, too. I am a Samsung Gear 2 owner, and I haven't seen any feature on the Apple Watch that is superior than the Samsung Gear, except the price. Watch (pun intended) for the Gear S soon! is it going to suffer from the same issue as GFLEX? it will be really bad! This is the first time I hear of this ghosting issue. Interesting. I didn't notice it on my own G Flex when I had it over for a review. Do OLED work outside in the Sunlight. because apple watch is shown being used outside. What is the lifetime organic material of OLED used on the Sun. Quantum Dot displays are also flexible. They are more efficient than OLED. and they are better than TFT. Apple is not likely to use tech that is not proven on the field like OLED. Quantum Dots are used in TVs and Tablets already. We shall see whether your source is right or not. 1. OLEDs do work outside. While early OLEDs had a problem in direct sunlight, the latest AMOLED displays actually outperform LCDs and are brighter. Today's Quantum Dot displays are still LCDs (with a different LED BLU and a QD film). They are not flexible. Actually while they have been used in some select devices, OLED panels are much more popular and have been "proven on the field" already. But of course, as you say - we'll see in early 2015!